The Maserati Tipo 61 was produced from 1959 through 1960. It was a bold departure from Maserati design custom. In Giulio Alfieri’s new design the 4.5-liter V8 engine of Maserati’s pervious sports car, the 405S, was replaced by a four-cylinder engine in a strong, rigid and lightweight chassis. The spaceframe chassis itself was constructed of around 200 small steel tubes, earning it the nick-name, 'Birdcage' Maserati. Rack-and-pinion steering was standard with the front suspension via wishbones while the rear was supported by a DeDion axle. Disc brakes were used all round. All of which gave the car a reputation for being easy to drive. The 250 S inline four cylinder engine was mounted at the front of the car. It was set at a 45-degree angle, lowering centre of gravity and frontal area. Two Weber 45 DCO3 carb’s breathed life into a 2.9 Ltr unit with dual overhead cam’s. It produced 250 horsepower at 7000 RPM. A five-speed manual gearbox fed power to the rear wheels. With its low weight, strength and great power to weight ratio it was highly competitive, and the winning record of the cars speaks for itself. Victory in the 1960 Cuban Grand Prix and the 1000km of Nurburgring, as well as Gus Audrey and Roger Penske capturing class championships in 1960 and 1961 SCCA racing seasons, exemplifies the diverse types of racing the car took part in. Production of the T61 ceased in December of 1960 with only 16 examples having been built. The 1961 Sebring 12 hrs was the first round of the FIA world sports car championship and second round of the FIA GT cup. 74 cars were entered but of them only 65 qualified, and of the 65 that took the le Mans style start only 37 cars made it to the end of the race. Built around the end of the 1990’s this was one of the earliest resin models built by Ian. The manufacturer did a great job of incorporating as much detail as possible so several different versions could be made from the same kit. Ian choose this version for the Graham Hill connection but also my other motor racing Sir Stirling Moss shared the drive. Building a resin model is not that different to building a plastic one, but you do need different adhesives and some safety equipment. You will be able to find an article on building a resin model in our Articles and Projects pages. Apart from the wiring behind the dash and the p.e. bonnet catches it was built straight from the box. Sprayed with Halfords car paints with the detail painting by brushed citadel acrylics the actual model is less than half the size you see here. 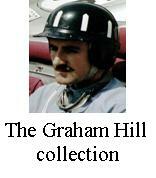 The Three cars together, all Graham Hill cars, are to give an idea of the size difference between the cars and eras. 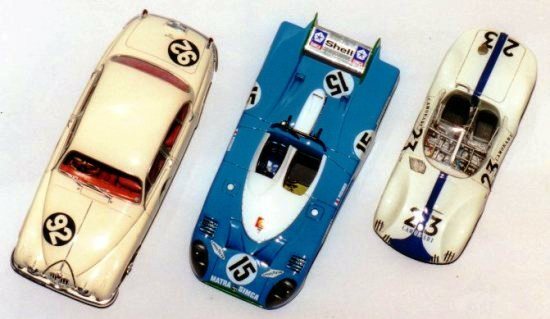 All of them are to 1/24th scale. The other two cars are the MKII Jaguar Coupe and Matra 670 le Mans winning sports car.